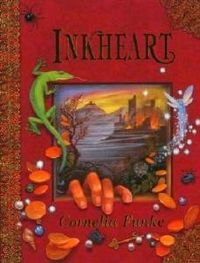 Inkheart is the first novel in what would become the Inkworld Trilogy by German author Cornelia Funke. Funke has written several novels but the most notable one published before Inkheart was The Thief Lord. In fact, it was after reading The Thief Lord that I became interested in Funke’s work. Inkheart was published in 2003, and it was the perfect book for a thirteen year-old fantasy genre loving teenager like me. Since then, however, I have read Inkheart and the subsequent sequels more than ten times. It is an addicting story- due to its complete ability to bring innovation into a rarely-explored theme. Inkheart features the story of Mortimer Folchart, a bookbinder, who one night accidentally reads three characters from a book called Inkheart in the novel. The three characters he reads into “our” or the “real world” are two villains, Basta and Capricorn and a fire-eater named Dustfinger, while three characters from “our” world disappear into Inkheart, Resa, Maggie’s mother and two of their cats. The story follows Mortimer or Mo as he is referred, his daughter Maggie, and the Inkheart characters. Inkheart begins one night when Dustfinger shows up out of the blue, to inform that Capricorn and Basta were looking for his copy of Inkheart. Mo takes Maggie to her aunt’s house to evade them, but Dustfinger later on betrays their location, as Capricorn has promised Dustfinger will be able to be read back into the book, something that Mo has denied and proven that he cannot pick and choose who or what comes out of a book and who or what goes into a book. Mo goes freely with what he believes is his copy of Inkheart, leaving Maggie and her aunt Elinor behind. But Maggie does not accept the kidnapping of her father and realizes that her father took the wrong book, she and Elinor and Dustfinger plan a way into Capricorn’s village to return the book in hopes of getting her father back. Mo soon demonstrates his abilities by reading gold out of Treasure Island and a young boy named Farid out of 1001 night’s version of Aladdin and The Wonderful Lamp. The story really changes however, when Dustfinger sets Mo and Maggie free after Capricorn’s men have burned all the known copies of Inkheart to avoid being read back into the book as Capricorn has found the evil in the “real” world as easy as the Inkworld. Dustfinger helps them escape along with Farid, and they search for the original author of Inkheart, named Fenolio, Mo desperately wanted to keep a copy of Inkheart as he feels it is his only tie to Resa, his only hope or chance of being reunited with her. Maggie finds out that Resa has already been read out of Inkheart by another reader by the name of Darius after she gets captured again by Basta one day while Mo is away. Fenolio was also imprisoned and together, they try an experiment out of curiosity while she waits for Mo to come for her. They discovers that she also has the power to read characters aloud from books. Soon Capricorn tells Maggie that she will be reading another evil character in from Inkheart, the Shadow, a hound that can devour any living thing and only comes when Capricorn calls him. However, with Fenolio’s experimentation, he and Maggie have found that they can change the way things happen, read characters back into their worlds, but all has to be done with the “right words”. Fenolio gives Maggie an alternative script to read and when the Shadow does come- it turns on Capricorn and kills him. The book is very interesting and has many twists and turns. Inkheart is a very rich story that continues to develop and change in the following books, Inkspell and Inkdeath and provides a new concept of bringing books to life. It is one of those books that gets better every time it is read and invites you in as much as it invites other characters from other worlds into “the real” world. I definitely recommend it as something to read if you like fantasy and love Harry Potter, it will change the way you look at books. 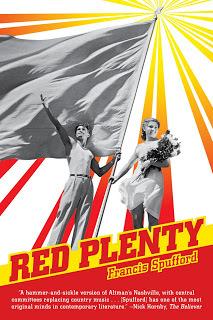 Recently I reviewed the novel Red Plenty by Francis Spufford (which can be read here: https://jhame085.wordpress.com/2013/08/23/red-plenty-by-francis-spufford/) I figured it would be fun to read another review of the book (in this case from the blog on Tor.com) to see what another reader enjoyed or didn’t enjoy about it. If you read the review you’ll find that the blog’s author, Jo Walton, seems to enjoy the book. Like me he mentions how he enjoys the mixture of historical fiction with historical facts to weave a very interesting and telling series of tales. Mr. Meier seems to go a step further into his back research of Francis Spufford research for the book than I did. He mentions in his article that some of the things that the charterers say in the book are, in fact, taken from direct quotes from real people living in the Soviet Union. Walton makes special note of many scenes from the book quoting them word for word. Walton is also amazed at the level of research Spufford acheived in his research of the book. He mentions the 53 pages of end notes that are included at the end of Red Plenty. Despite the fact that I knew that there were so many end notes in the story it is only after reading this article that I can genuinely appreciate the hard work put into this book. To be honest I feel that this ignorance is quite common among avid readers like myself. We are often so ignorant at the level of hard work our favorite authors put into writing their books.